This is another great morning cocktail recipe or great for brunches and is on of my personal favourites because of the sweetness of the drink. The grenadine wakes you up with a sugar rush while the orange juice helps your toast and cheerios go down better with an Advil or two. I first discovered this wonderful cocktail recipe in Acapulco a few years back. In talking to the bartender, I found out the Tequila Sunrise was originally served in the 50′s in Acapulco. After the 70′s, discos, bell bottoms, perms, and afro, this cocktail lost most of its fame due to the change in types of guests frequenting the west coast of Mexico. Despite it’s age, it is still a great cocktail. Very slowly add grenadine into the drink. You want to prevent excessive mixing of the red and orange! The thickness, and higher specific gravity of the grenadine will cause the red syrup to sink to the bottom of the glass. 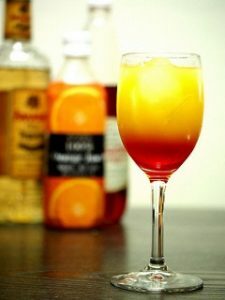 The red will cascade over the ice and create a red-orange glow on the lower portion of the drink… resembling a sunrise. The tequila sunrise can also be changed up. By swapping out the tequila for a nice rum, you can create a Caribbean Sunrise. If vodka is your preference, the drink closely resembles the orange Screwdriver with grenadine… making it a Russian Sunrise. You can also turn this drink into a sunset! Instead of finishing the drink with a dash of grenadine, float a little cherry brandy on top. Again if you wanted a Caribbean sunset… you could start with your rum and orange base, then finish the cocktail with a cherry brandy float. Swap the cherry brandy for Galliano, and your vanilla spice liqueur float makes it a Tequila Wallbanger!